Tiki drinks get a bad rap. They’ve earned a reputation as fruity girly drinks served to lightweights in garish glasses with stupid paper umbrellas. You would never know that some savvy bartenders who knew a thing or two about making stiff drinks for a thirsty clientele invented most of these cocktails. Share the Drink: In addition to featuring 150 well-sourced tropical drink recipes, Tiki+ also lets you share what you're drinking via Facebook and Twitter. Take the Mai Tai, for instance. Chances are, if you’ve ever had a Mai Tai at a bar or a party, it’s looked and tasted like Hawaiian Punch spiked with rum. If that’s the case, I have some bad news and some good news. The bad news is, you’ve never had a real Mai Tai. A restaurateur named Victor Bergeron mixed the first Mai Tai in the decidedly un-tropical climes of Oakland as World War II was winding down. He used a top-shelf rum, French Curacao, almond syrup, sugar and fresh lime juice. And it was spectacular. The good news is, you can find the authentic recipe (or the closest thing to it, since the rum that “Trader Vic” used in the original is no longer produced) in Skorpiotech’s terrific Tiki+ app for the iPhone and iPod touch. Tiki+ is a companion app to Skorpiotech’s indispensable Cocktails+ application ( ). The interface is much the same as the original app, which improves with every update. The developers have added some clever graphic content, including some terrific illustrations and photos, and incorporated explanations of beverage types and brands linked within recipes. On the off chance, say, that you’re fresh out of okolehao (a kind of Hawaiian whiskey), you can tap the ingredient for possible substitutions (rye works). There is also an extensive information section, which includes Web links recommendations for further reading. What really sets Tiki+ apart is its content. The app features just 150 drinks—considerably fewer than the database in Cocktails+ or other bartending apps. But what drinks! The app draws largely from the work of Jeff Berry, best known among aficionados as Beachbum Berry, a.k.a. “The Indiana Jones of tiki drinks.” Berry’s claim to fame is his discovery of the original recipe for the Zombie—another drink, like the Mai Tai, that had been corrupted over time by ignorant bartenders. Berry’s books, which include Beachbum Berry’s Grog Log, Beachbum Berry’s Intoxica!, and Beachbum Berry’s Taboo Table, are not just compendia of recipes. They’re rich histories. Alas, almost all of Berry’s books are out-of-print and very expensive if you manage to lay hands on a used copy. So, at $4, Tiki+ is a great resource and an even greater bargain. Beautifully rendered and, thanks to Berry’s tireless reporting, impeccably sourced, every recipe includes a reference to where the drink first appeared. Users will quickly discover two things. First, you need a blender. Second, most of these drinks were invented in California between 1935 and 1955 by two men: Donn “Don the Beachcomber” Beach and the aforementioned Trader Vic. Tiki+ also lets users browse and search by ingredient (dark rum, light rum, vodka, and so on), flavor, tag or type of drink (blended, cocktail, hot, punches, etc.). My old complaint with Cocktails+ holds somewhat true here: You still cannot add notes or make edits of your own in Tiki+. But these recipes are so good that you would be foolish to change a thing. 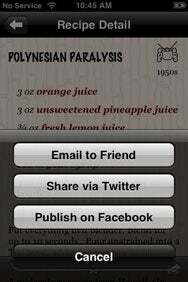 Tiki+ lets you share what you’re drinking via Twitter and Facebook. But, as with Cocktails+, you need Twitterrific ( ) installed on your mobile device for the auto-tweet feature to work. I did uncover a couple of bugs with the social networking part of the app, however. I found that if I wanted to modify a tweet, the Twitter server would time out. (I didn’t want to share with the world that I was enjoying a Mai Tai at 1:00 p.m. on a Monday, especially when I was drinking nothing harder than a cup of coffee.) It also timed out when I tried to send a message unedited. This may also be a lingering problem with Twitterrific, which was a prominent victim of the recent “twitpocalypse”. On the other hand, I had no choice but to share with my Facebook friends that I’m quaffing top-shelf rum drinks early on a weekday afternoon. And when the news appeared on my feed, it linked to the Cocktails+ app Web page, rather than anything Tiki-related. As good as the former app is, I wonder if Skorpiostech wants to encourage that kind of brand confusion. The only way to take full advantage of the Tiki app’s features is to experiment boldly. I did so at length and with the help of a few dozen close friends at a house in Long Beach over 10 hours one recent Saturday. From what I recall, the drinks were delicious and the app performed admirably. The takeaway? The Mai Tai remains the queen of the tiki drinks, Zombies taste better from garish plastic pineapple pitchers, and the Painkiller… isn’t. Tiki+ is compatible with any iPhone or iPod touch running the iPhone 2.2 software update.